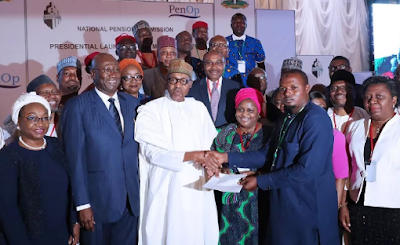 President Muhammadu Buhari has unveiled a Micro Pension Plan for people operating in the informal sector of the economy, even as he promised to halt the rot in the nation’s pension system. The President, while unveiling the pension plan on Thursday in Abuja, noted that those in the informal sector needed to be captured in the plan just like those in the formal sector. The Micro Pension Plan targets the majority of Nigeria who are self-employed. With an estimated 80 million people working in the informal sector of the economy, the Micro Pension Plan would take care of participants from various informal sector workers including market women, members of the National Union of Road Transport Workers, and members of textile, garment and tailoring associations. Others are tricycle operators and Okada Riders Associations, butchers associations, workers in the movie and performing arts industry, mechanics and other workers in the automotive industry and single professionals like lawyers, accountants and many others. Earlier, the acting Director-General, PenCom, Aisha Dahir-Umar, disclosed that up to N6.51tn of total pension assets had so far been invested in government securities. She added that this represented 73 percent of the total pension assets. The DG explained that another N95.31bn was invested in infrastructure, while N7.19bn went into the subscription Green Bond. Explaining the Micro Pension Plan, she said that under the plan, 40 percent of the amount contributed could be accessed for contingency purpose while the balance of 60 per cent would be set aside for retirement benefit. She said while contributors could start drawing from their 40% contribution after three months of making the initial deposit, the 60% balance could only be accessed at the age of 50 during retirement. She said through the implementation of the Micro Pension Plan, it was expected that the level of old age poverty would be reduced by 85 percent.